We’re down to 57 days people! It still doesn’t feel real! I feel like I’ve been planning a huge party for someone else or something. Well except for when we have to pay for things. That’s when it becomes quite evident that the party is for us. I’m not used to writing personal blog posts, although I know blogs are probably supposed to be personal at some times. 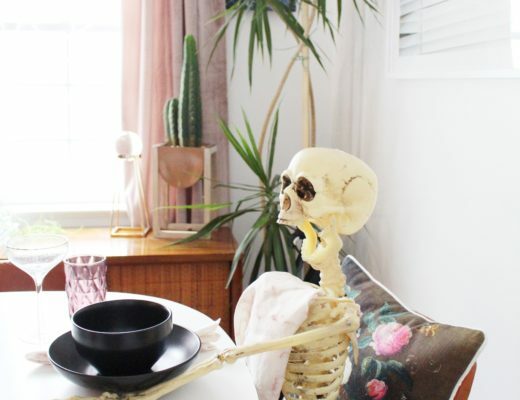 I’ve built friendships online ( I know that sounds weird but it’s true ) with my followers and other bloggers so I guess it’s fair to at least talk about my personal life sometimes. Mike and I have been together for almost 7 years. (let’s just say 7 because it’s easier and sounds like we really know what we’re doing when it comes to making a relationship work) We got engaged after 4 years. October makes it a 3 years engagement but we’ll be married by then so whatever. The truth is I was not planning a wedding for 3 years. I just started planning our wedding 3 months ago. I think that’s just how I live my life. I work better under pressure or else I get distracted. Some people are shocked that I only had this much amount of time but I just don’t see me needing much more. Going on how much I switch the rooms in the house, I think if I had a year to plan I’d probably switch the whole wedding 4 times. However, I was getting a little nervous about finding a dress. Now let’s get down to the fun stuff! Dress by Chosen by One Day. Also, how cute is that “totes getting married” bag? I can’t even explain in words how grateful I am. That leads me to tell you how honored I am to partner with Lovely Bride. I never thought I would be able to have a dream wedding or a wedding at all, that some girls are blessed to have. I think it’s wonderful when families can provide such an amazing experience for their children but I just wasn’t in that position. Which is fine so I kind of just had the idea I wouldn’t have one. I partnered with Lovely Bride and it’s really the moment my dreams came true. 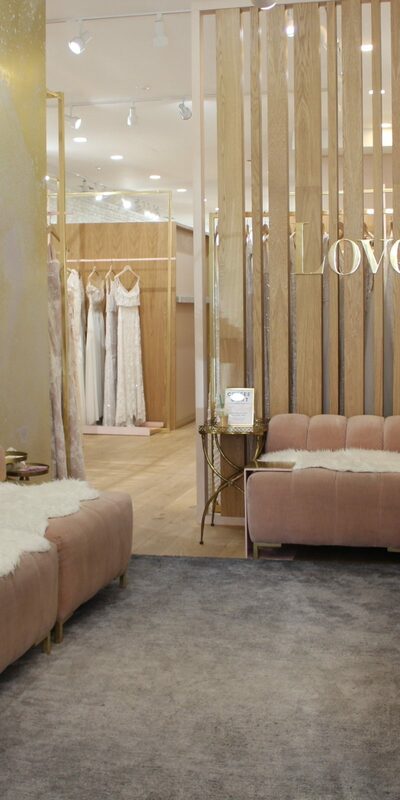 If you’re on the hunt for your wedding dress you have to go to Lovely Bride. HAVE TO! 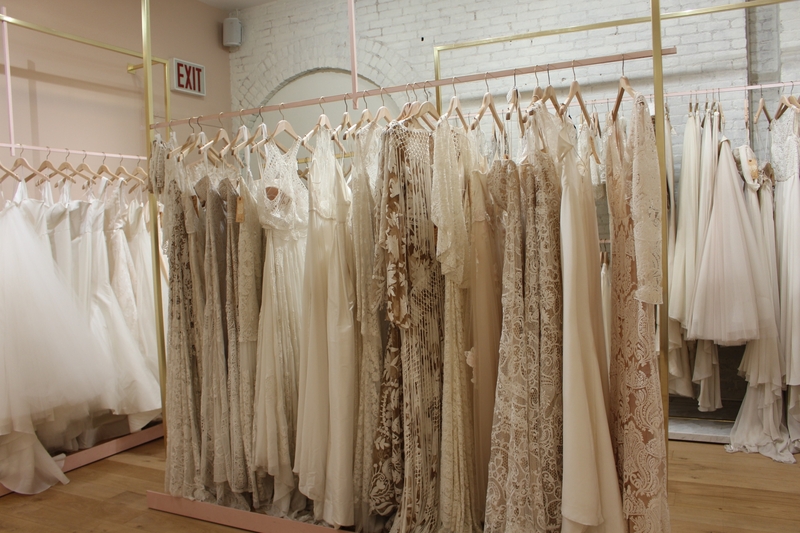 I went dress shopping at Lovely Bride NYC and I have never seen so many beautiful dresses in my life. Not only are the dresses STUNNING, but the employees were seriously wonderful. I went to two other stores before going to Lovely Bride and it was NOTHING like Lovely Bride. I was beginning to feel quite hopeless and depressed actually. PICTURE THIS. In the one store I had this lady helping me who was picking out horrendous dresses and looked nothing like the photos I showed her. She was helping 4 other people at the same time, the dresses were beige (they used to be white) and she had a raspy smokers voice like none other. After trying on the third dress and not liking it she says (in her raspy smoker jersey accent) “Well ya better pick somethin’ because you’re running out of time”. So I said, “I’ll cancel my wedding before I wear one of these dresses” and shut the door. That was pretty much my experience at the one place. The other place just wasn’t my style. I was having trouble finding a dress with a little edge, something different. … but Lovely Bride saved the day, the week, the year, and my life. Dramatic but true. This is Ryan. He’s the best. Lovely Bride offers an amazing variety of dresses. I seriously think ANYONE can find a dress there. I was a bit overwhelmed because I liked so many! Ryan helped by pointing out exactly what he thought would fit nicely with my theme and in my budget. I initially went in with a “tropical boho” type of theme in my head. 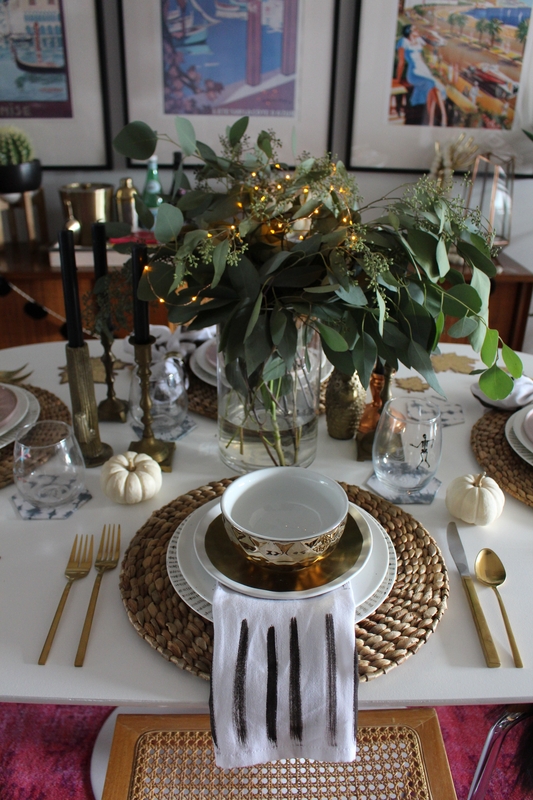 I wanted something really bohemianesque (which is quite easy to find at Lovely Bride). I ended up finding something a littttle different. I switched around a ton of things for the wedding because I loved the (my) dress so much. They have a GORGEOUS variety of edgy bohemian style dresses though. 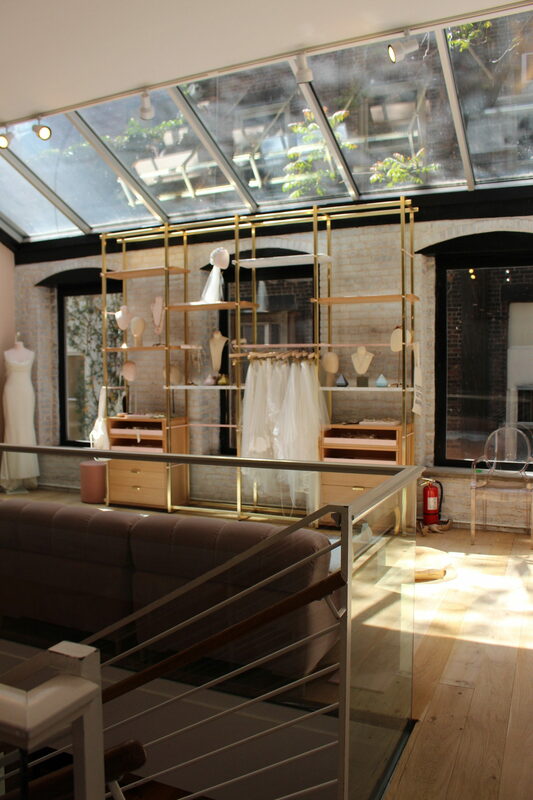 A brand that really stuck out to me was Rue De Seine Bridal. OH.EM.GEE! 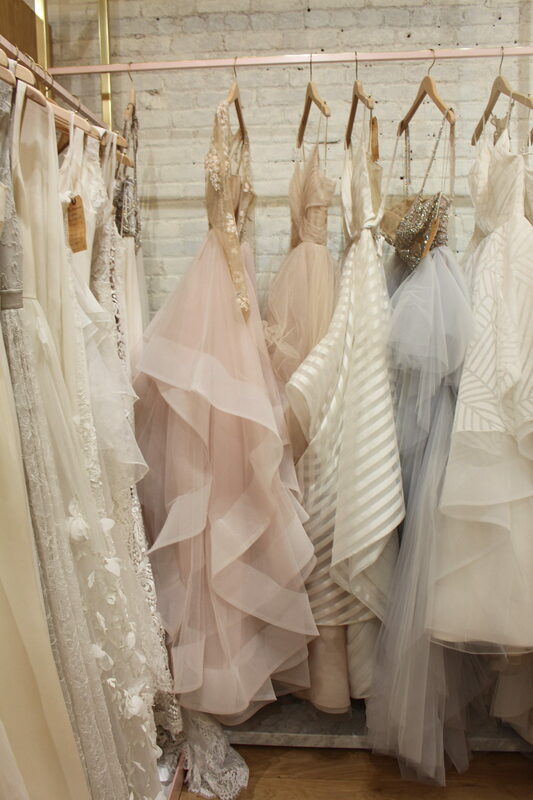 These dresses are literally to die for. This is one of their dresses below. 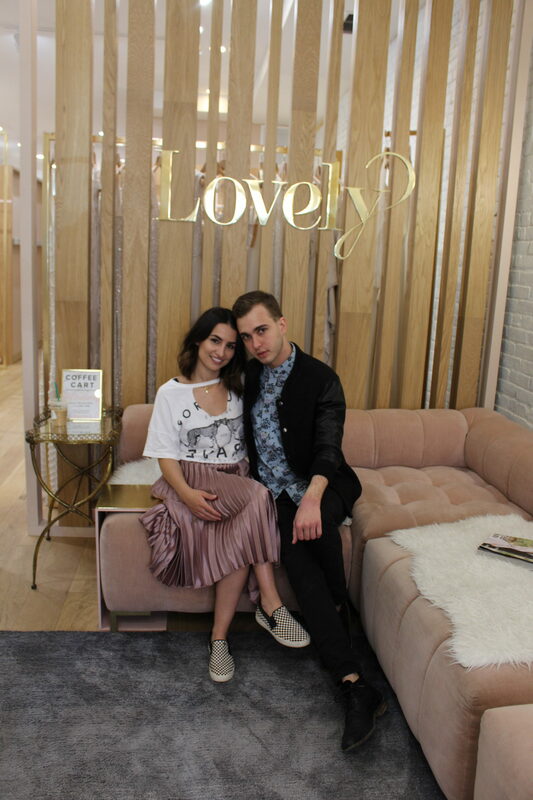 Speaking of stores… can we talk about decor for a second? This place is DREAMY! I’m not going to lie, I kinda fell in love with Lovely Bride for the decor/atmosphere too. I just felt like it would be such a dreamy experience and Lovely Bride delivered! They have 11 other locations and they’re all just as gorgeous! Did you peep the letter board? “OMG Becky look at her dress” too cute!! 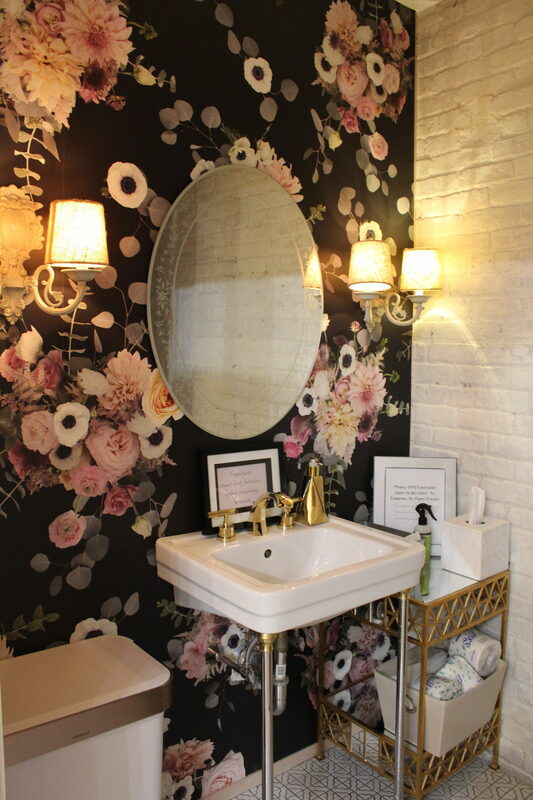 We also need to have a moment for this wallpaper by Calico Wallpaper. Talk about dreamy! I just really wish I could transport this sofa and wallpaper right into my house. I’m not kidding when I say they almost had to kick me out. Ok, I’m kidding a little but I did hang around taking pictures of the store. How could I not? GORGEOUS! Cracking up because YES, I took a picture of the bathroom! I actually may copy this entire bathroom. #inspired. The infamous wings! So this is where people stand when they find their dress. I totally stood here and felt like a princess. Also check out the bridezilla shirt. How cool is that? It obvs looks beautiful with that pink skirt. The skirt makes you appear less zilla-y and more bridey. All in all, Lovely Bride made my dreams come true. 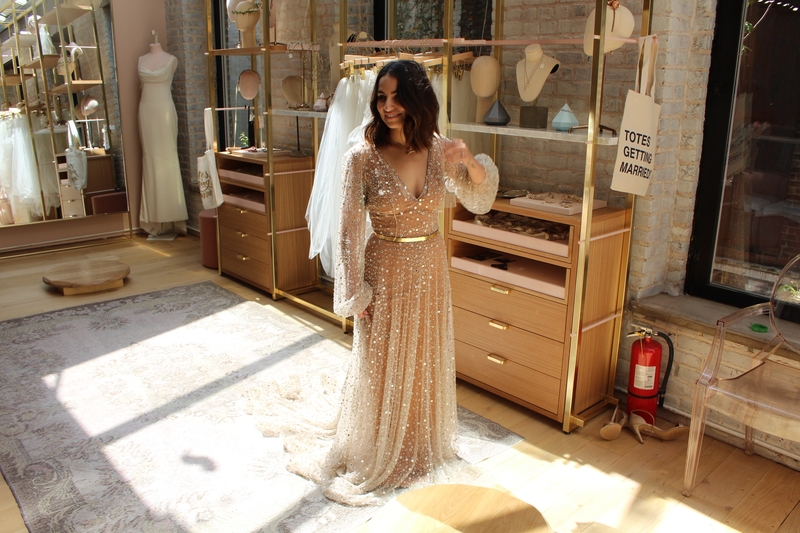 It was everything I could imagine for wedding dress shopping. I honestly didn’t want it to end. 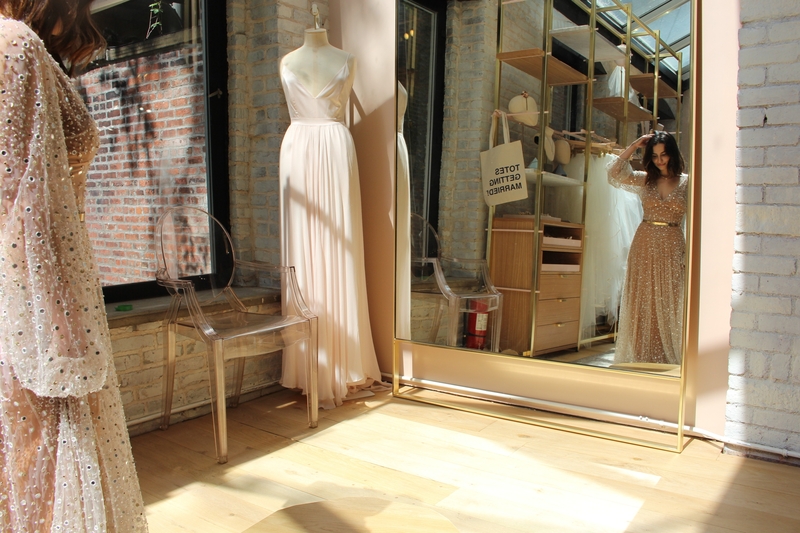 Between the atmosphere, the employees, and the dresses I was seriously in heaven. I cannot wait until our big day! IN 57 DAYS i’ll be able to share my Lovely dress with you all! Thank you so much Tiff! Same. Their decor is awesome!